Premise- Three teams made up of three contestants each will compete in a series of rounds in which they are quizzed on Biblical trivia. In the first and second rounds, the teams will be asked questions worth 10 and 25 points, respectively. A correct answer earns the team points, while an incorrect answer takes points away from a team. In the third round, only two teammates from each team will be allowed to play, the questions are now worth 50 points each, and there are no penalties for an incorrect answer. In the fourth round, only one player is allowed to play, preferably the teammate who knows the most about the Bible. One question will be asked to each team and they will have to provide three correct answers worth 100 points each. The two teams with the most points at the end the round will advance the final round. The other team will receive a consolation prize of $2,500. In the final round, the “Revelation Challenge”, the remaining two teams will have 60 seconds to answer as many questions as possible, out of ten, in a given subject. Each team will be asked the same questions. The team who answers the most questions correctly will win $20,000 for their charity, while the runners-up will receive $5,000. When I first saw the previews for this show, I had mixed feelings concerning its success on GSN. This show seems fit for TBN or CBN, but GSN still found a way to make it work. 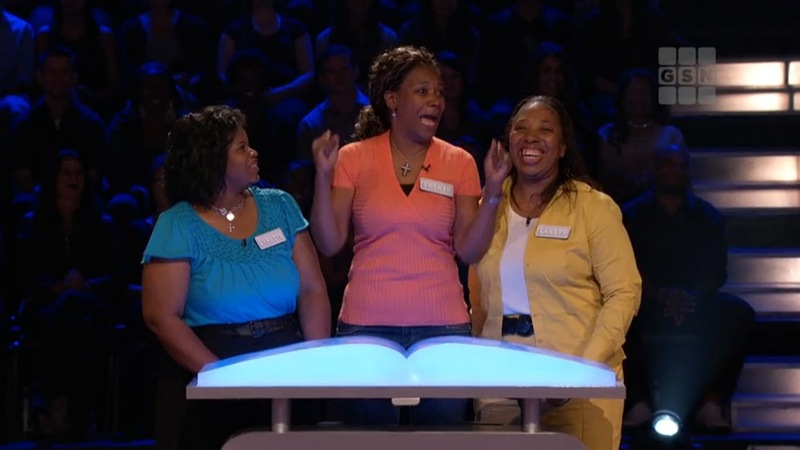 The American Bible Challenge did what the failed ABC game show You Deserve It should have done. I like the tournament format for this show to keep the viewers tuned in for each episode. 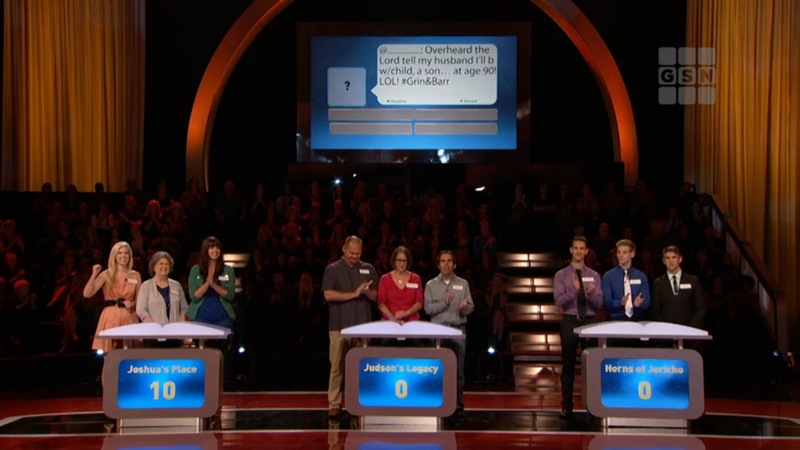 I am also impressed with the show’s creative gameplay, from the progressively difficult questions to ease the contestants comfortably into the game to the 10-minute “Bible Study” period prior to the final round. The competitive gameplay also makes the show interesting to watch, especially the Revelation Challenge end game, which is essentially a combination of Free For All’s round-robin bonus round and Win Ben Stein’s Money Best of Ten Knowledge end game. I enjoy watching these contestants share how much they know about the Bible through answering the questions, especially recalling some of the more detailed Biblical information such as naming multiple items at the Last Supper. There were a few elements of the show that didn’t win me over: The American Bible Challenge Choir and the videos introducing each team. While it is unique to have the choir singing before and after the commercial breaks, it doesn’t add much to the show overall and their presence is unnecessary. As for the video introductions, I have never been a fan of a video introducing the contestants in lieu of host conducting the interviews for each team. Although the videos give the home viewers the group dynamic, I believe that this still comes off as laziness by the producers and host. The videos should be placed before and after each commercial break to compliment the host’s interviews, rather than completely replacing it.As for the host, Jeff Foxworthy seems uninterested in hosting this show. He doesn’t show the same enthusiasm as he did on Are You Smarter Than A 5th Grader? You can tell by how he reads the question in an almost monotonous fashion that he might not be as into the show as you would think. Aside from that, Foxworthy is doing a decent job of hosting the series so far. Overall, if you’re looking for a fun, feel-good game show, then you have come to the right place. You rarely see game shows where non-celebrity contestants are willing to play for a charitable cause and get just as excited as well when they do win big money for deserving people. The series premiere of The American Bible Challenge drew in the largest audience GSN has ever seen with 1.73 million viewers watching. With these ratings, I think GSN will strongly consider bringing this series back for a second season. Watch new episodes of The American Bible Challenge Thursdays at 8:00pm on GSN!